Here's what I do instead! Many of you know that I don’t like bu*#!ting (I don’t even like to say the word budget). And it hasn’t been for lack of trying. In the past I’d get myself psyched up to do it, but it would always end up feeling like a big guilt trip that wasn’t all that effective. Saving wads of receipts to punch into the computer or the mild depression that would ensue every time I logged into Mint.com just wasn’t for me. Unfortunately, I’m not a natural saver (if you are, this post isn’t for you, so don’t waste your time). Out of necessity in graduate school I concocted my own system that worked so well for me that I’ve been using it ever since. 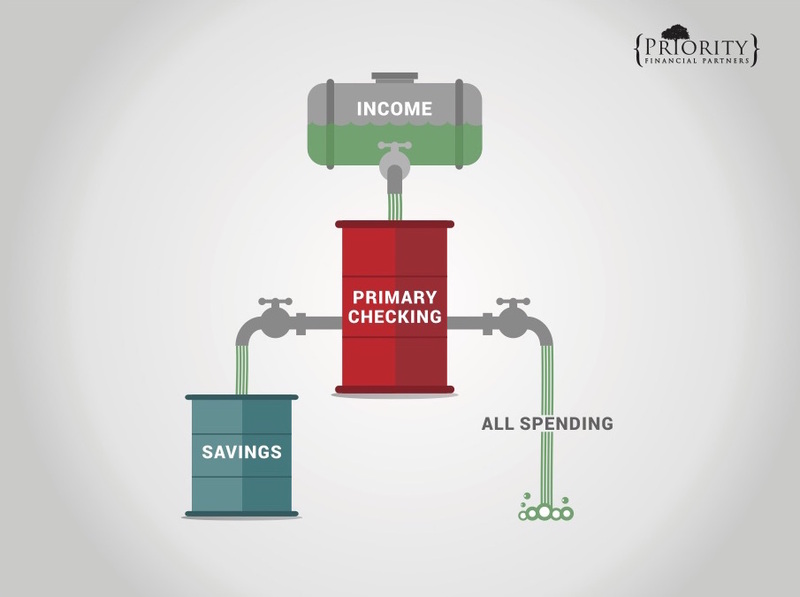 As money is earned it flows into your checking account and from there it is either spent or saved. Hopefully the saving is done first and on an automatic basis, instead of the more common approach of spending first and saving whatever is left over at the end of the month (which tends unsurprisingly to be very little when one follows said strategy). My system isn’t really anything but a twist on the envelopes that my grandmother used to bu*#!t her money back in the day. Each week she would cash her paycheck, put 10% in her savings account and then divide the remaining cash into different envelopes, each labeled with a spending category. There is a great story in the book Nudge about Dustin Hoffman as a struggling young actor who, much like my grandma, kept his money in different mason jars on his kitchen counter. One day when Gene Hackman comes to visit, Hoffman asks him for a loan. Puzzled, he asked why someone with so many jars full of cash would need a loan and in reply Hoffman simply pointed at an empty jar labeled “Food”. I actually tried the Hoffman & Grandma approach, but the hassle of going to the ATM constantly and walking around carrying envelopes full of cash didn’t go over all that well for me (ah, first world problems). The other problem I ran into during my quest to find a workable bu*#!t was having so many different categories to deal with. It seems to me that if I want to splurge on Justin Bieber tickets and cut back on eating out for the month to compensate, what’s the difference? It took a little getting used to, but I soon began to realize how quickly pizza, lattes and happy hour add up. While a traditional bu*#!t accomplishes the same thing, this was different because it actually forced me to change my behavior. I started making decisions like “Eat out for lunch everyday this week or go to the concert this weekend?” and the threat of having my card declined put some teeth behind those choices. There were also some unexpected perks, like buying a candy bar and not having a panic attack thinking about the extra student loans I was taking on to pay for it – I knew it was in the plan. I also experienced the magic of delayed gratification. It’s amazing how much more you actually appreciate something when it takes some time to save up for it (an all but non-existent concept in today’s age of “easy” credit). Our joint “bucket” is a secondary checking account that we each have a debit card for, which we use for any discretionary expenses that we incur jointly (ie going to the movies, etc). We also receive a weekly allowance in our separate accounts to spend as we please. While it sounds like an overwhelming amount of card shuffling, in reality I only have three cards in my wallet: my joint bu*$!t card, my individual bu*$!t card and a credit card for everything else (ie non-discretionary expenses). My wife was hesitant at first, but she ended up loving it as well. She started affectionately calling the debit card to her individual account her “fun” card. When I come home with a stack of albums from the record store or her with a Nordstrom bag full of makeup, neither of us bats an eye. Because of this we have almost zero disagreements about money (which as many of you know is the number one cause of divorce). And because of our joint “bucket” we can actually allow ourselves to take an occasional trip to Telluride for the weekend without the guilt. 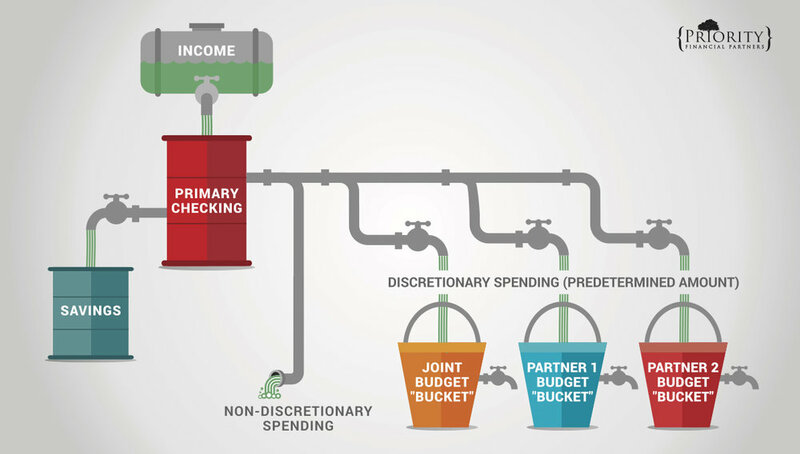 Discretionary is an ambiguous term, so a big key to your success is going to be defining what type of spending will come out of your discretionary bucket(s). Take gas for example. Most of the driving I do isn’t essential, so, therefore, one could argue that it is technically a discretionary expense. But the fact of the matter is, I’m not concerned I’m going to break the bank by deciding to go nuts and drive circles around the state just for fun. Personally, any spending on entertainment, food, clothes and gifts comes from one of our discretionary accounts (and to be clear, we don’t have a separate account for each of the categories, only hers, mine or ours… when we spend on one of the aforementioned categories, which account it comes from is just a function of whether the expense is incurred jointly or individually). I would suggest starting with fewer categories, if not just one, until you work the kinks out. Choose what you typically have the tendency to overspend on the most. For example if you eat out at restaurants a decent bit, start out using the system for just that. Arrive at how much you would like, or more accurately can afford, to spend per month total on the categories you determined in step 1 (tip: lean on the high side, you can always lower it later. Like a diet that’s too restrictive, having an unreasonably low amount is going to almost guarantee you don’t stick with it). Now divide your amount out into a weekly total. For example, if in step 1 you decided on eating out and entertainment, you might arrive at an allowance of $50 a week to spend individually and $75 to spend as a couple. If you’re single: Go to your bank and have them add a checking account and set up an automatic weekly transfer to it in the amount determined in step 2. If you’re married: Go to the bank and have them add one joint and two individual checking accounts (yes, you may get some weird looks). Then have them set up automatic weekly transfers in the amounts determined in step 2. Continuing our example from above, that would mean a transfer of $50 a week to each of your individual accounts and $75 to the joint. An important note – Not all banks will work. The first thing to make sure is that they won’t charge you any monthly fees for the checking account or debit cards (most don’t). Also check if they will allow you to turn off overdraft protection, as the whole point of the system is not being able to spend money that isn’t there (some of the big banks have decided they’d prefer to force you to pay the fees). If for some reason your bank won’t work, all isn’t lost. Several of the online banks have free checking that will accomplish the same thing while keeping your current bank for your primary account (last I checked Ally bank worked well). After some time with the new system, more than likely you’ll find that the amounts you initially choose were either too high or too low. The secret is to make sure you update them as needed instead of giving up all together. Just plan on the first few months to be a learning curve. It will take some time getting used to thinking about which card you pull out. You might find it helpful to label your card with a sharpie (my wife developed quite a reputation with the baristas at the coffee shop because she has written “Fun Fun Fun” across the top of hers). Once you get it set up, this system makes budgeting incredibly simple, but as anyone trying to get to the gym three weeks into their new year’s resolution can tell you, simple and easy are two very different things. Just as it’s easy to throw your diet out the window for whatever you’re craving to eat, it’s just as easy to be tempted to go on an a credit card fueled Amazon binge. But like a winning contestant on the Biggest Loser would tell you – it might not be easy, but it’s definitely worth it.